I’m very happy to announce that I am now an official endorser of Bogart basses. I’m currently using a prototype Karl Clews Signature model, nicknamed the Silver Surfer, and when I’m finished roadtesting and tweaking, Bogart will be making this model available to the public. 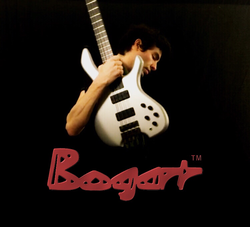 In the meantime, please check out Bogart’s wonderful instruments at www.bogart-bass.de. I'm very pleased to present my custom, handmade leather guitar straps, made for me by the very talented Willian Brito of River Straps. These are high-quality, beautifully crafted straps - please check out Willian's site at www.river-straps.com. I'm happy to announce that I'm now an official endorser of David Laboga's Bass Series instrument cables. These are high end, hard-wearing, great-sounding cables, hand made in Poland using top quality components, designed especially for use with the bass guitar. I can certainly hear an improvement in my tone when I use these, and I think you will, too - check out David's site at www.dlcables.com for more information and to order your own. ​Latest news: I am now on Patreon! For as little as $1 per video, you can become a patron and help me make more and better quality videos and bass arrangements, in return for tab and sheetmusic transcriptions, audio downloads, exclusive videos, shout-outs and more. Check it out here! If you don't want/need the transcriptions of my bass arrangements, or you don't want the monthly commitment of my Patreon page, but would still like to show your support occasionally for what I do, please consider using my digital tip jar below! My latest solo bass arrangement on YouTube, featuring my brand new Bogart bass.